A new study suggests that people should regularly eat apples not necessarily to keep the doctor away, but as a means to reduce national health care spending. The article presents the results of a classic epidemiological study – a cross-sectional analysis of the U.S. National Health and Nutrition Examination Survey (NHANES). NHANES is a long-running nationally-representative survey of civilian, non-institutionalized American adults. The survey is conducted every few years, when a new random sample of the population is drawn. The authors of the study pooled together respondents from the 2007-08 and 2008-09 rounds of the survey, to get an eligible sample of 12,755 survey respondents (1). From there, they used data from 24-hour dietary recall questionnaires, demographics, health examinations, and health questionnaires completed by the survey respondents (1). After accounting for missing data, excluding all survey respondents who reported that their 24-hour diet questionnaire that they filled out was not representative of their usual diet, and those whose apple consumption came solely from apple juice and apple sauce, the study included 8,399 study participants (1). The researchers estimated the total grams of raw apple consumed by each study participant during the 24-hour dietary recall period, by linking the reported foods to the U.S. Environmental Protection Agency’s Food Commodity Intake Database (1). They defined study participants as ‘apple eaters’ if the daily amount of apple they reported eating was equivalent to 149 grams (1 small apple). They investigated whether there could be a dose-response relationship between apple consumption and avoidance of health care visits by comparing the effect of eating 1 small vs. 1 medium vs. 1 large apple per day against eating no daily apples. “Keeping the doctor away” was defined as successfully avoiding more than one visit to a physician in the past year. One physician visit was allowed, as American adults are recommended to visit their doctor each year for an annual health check-up. The researchers estimated that 19.3 million U.S. adults are ‘apple eaters’, who consume about 26.9 million small apples daily, weighing 8.8 million pounds (1). In contrast, 207.2 million adults were estimated to be non-apple eaters – the majority of the population. Apple eaters were no more likely to avoid visiting the doctor than non-apple eaters (Odds Ratio = 1.19; 95% Confidence Interval: 0.93-1.53), regardless of the size of the daily apple (p-value for trend = 0.06). There was also no difference in overnight hospital stays or mental health visits between apple eaters and non-apple eaters. 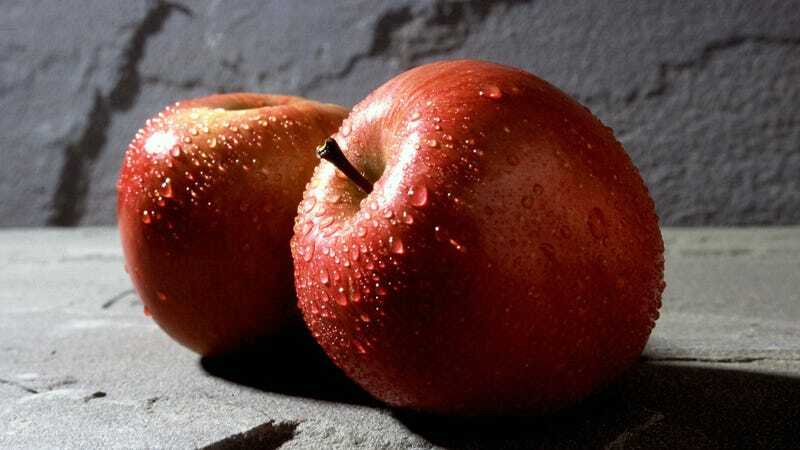 However, people who ate a daily apple seemed more likely to avoid taking prescription medications than non-apple eaters. When comparing ‘small’ and ‘large’ apple eaters against non-eaters, there were no differences in medication-taking, as the odds ratios were of small (but positive) magnitude and the 95% confidence intervals were wide, indicating imprecise estimates due to small sample size. However, the odds ratio for ‘medium’ apple eaters was positive and statistically significant for avoiding taking prescription medications, and the overall trend in the dose-response relationship between size of daily apple and odds of avoiding medications was statistically significant (p-value for trend = 0.02). Trend analyses, while reliant on p-values, are useful in small sample size situations where a linear dose-response relationship is plausible, as they indicate the overall relationship across categories of exposure (a.k.a. size of apple). It doesn’t quite roll off the tongue, but certainly gets one thinking about how and why these aphorisms come into use in the first place.